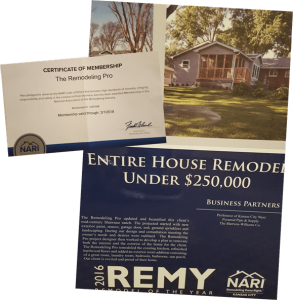 The Remodeling Pro is proud of its NARI 2016 REMY nomination and participation in this year’s Remodel of the Year Award competition. Companies from Kansas City and around the country shared their favorite remodeling projects with their business peers in hopes of standing out in the crowd. Kudos to all who participated. This year the Remodeling Pro shared a whole home remodeling project in Shawnee, KS. This mid-century ranch home project included exterior paint, stucco, a new garage door, sod, ground sprinkling system and landscaping. All totally changed the look and feel of the homes curb appeal so much “The neighbors are jealous” said Mrs. Simmons. This project when complete encompassed a whole new addition to the home. The Remodeling Pro helped add living space, new master bedroom with en suite, a new screened-in porch and complete kitchen renovation. The Remodeling Pro worked with the owners to develop a schedule and budget for the project that best suited their needs. Thanks to the Simmons family for trusting us with their home remodeling projects and the businesses that offered supplies to complete the project on schedule and budget. Those businesses included in our project were – ProSource of Kansas City West, Pyramid Pipe & Supply, Onyx, and The Sherwin-Williams Co. If you would like to have your home remodeled, no matter how large or small the project call The Remodeling Pro now at (913) 268-9800. We promise SOLUTIONS, SERVICE & SATISFACTION.